Amongst the vineyards of Halfpenny Green lie two magnificent lakes, both of which are providing anglers with some amazing fishing this summer. One of them, Heron, has only been opened to the public since June 2013 and has already seen nets close to 100lb being caught. The venue is also planning to open a third lake sometime next year but it is the original Moorhen Lake which is the most prolific. Every one of the lakes 28 pegs offers the chance of a net over 100lb with match weights having been recorded close to 200lb this year. This lake is predominantly a carp water with fish averaging around 3lb but there are also the odd bream to around 8lb as well as tonnes of roach to 2lb. It is important to take plenty of bait with you for these fish as the 194lb match weight this year was landed by using up to no less than eight pints of micro or 2mm pellets as feed and then fishing a bigger 4 or 6mm banded expander pellet over the top. Keep the pinging or toss potting the feed in and keep moving the bait for more bites. At this time of year the mainstay of the catches are being made shallow or in the margins where paste or corn can also work. From pegs 23-25 or 12-14 you can reach the island using the pole and these can be good pegs on harder days. Heron Pool (29 pegs) is deeper, averaging around 9ft, and is well-stocked with a whole host of different species including carp to 15lb, bream, ide, barbel and chub averaging around 1lb as well as golden and blue orfe. Fishing on here therefore provides you with a sense of un-expectancy, as you never know what you are likely to hook next. Successful baits on here include corn, meat and pellets, with typical commercial tactics paying dividends. The island at 20m can also be targeted with a cage feeder filled with maggots and pellets. Like Moorhen though, the fish are currently feeding well up in the water at present. 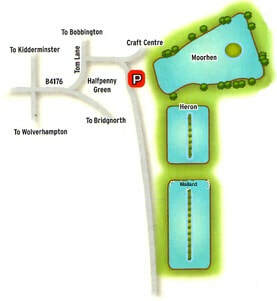 Plummet accurately on Moorhen Lake as there are plenty of depth variations and underwater features to aim at. Float fishing is the most popular method. The message is to keep things nice and simple. In the cooler weather try maggot, caster or pellet but as it warms up, corn or meat over micro pellet can be deadly for mixed catches, including a good deal of carp. In the summer use a bigger bait for the better carp. Fish to any of the bankside features. No ground bait, floating baits or method feeders allowed. From Wolverhampton take the A449 towards Kidderminster. At Himley pick up the B4176 towards Bridgnorth. After four miles turn left into Tom Lane. Keep on this road going through Halfpenny Green towards Bobbington. 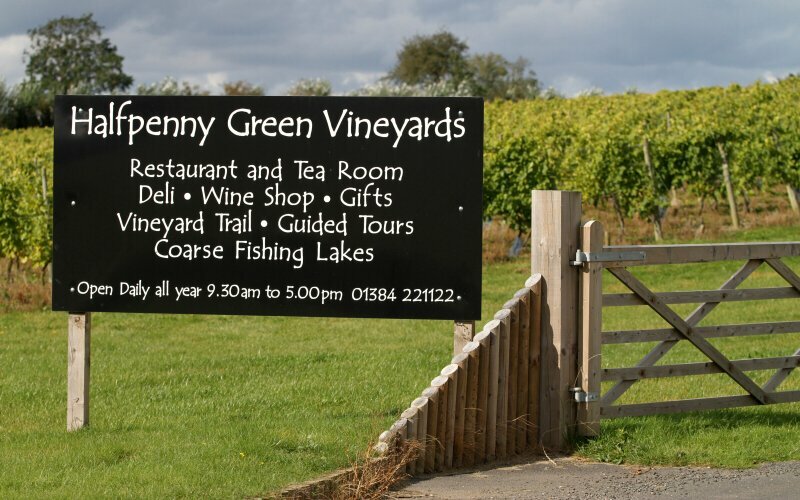 You will see a sign on your right for Halfpenny Green Vineyards and Craft Centre. Go down the track and you will see the fishery sign.